My friend Kerri forced me to get Stephen King’s On Writing. I almost never read books about writing any more because it’s just too much like work, and besides, after Strunk and White, what more needs to be said?. I was in no hurry to read it, but after a year and a half guilt finally moved it off the to-read pile. Started it. Enjoyed his life story. Liked Bill Bryson‘s better. He reveres The Elements of Style, okay, he’s showing me something. He thinks adverbs are the mark of a lazy writer, me, too. His life story went fast, and now I’m bogged down in the how to write part. Too much like work. I’m going to stick to it at least until the scene where he’s laying on the side of the road thinking, “OMG, I’ve been run over by one of my characters,” which of course I’ve heard about, as who hasn’t. Okay, time to stop whining. This is a good book. It is in fact (oh, he’d smack my hand for that phrase) three good books, or novellas, if such a term may be used to describe non-fiction. The first is his life story, the second is a primer on the craft of writing, and the third is the account of his close encounter of the van-crazy-guy-and-Rottweiler kind. The first is entertaining as hell, the third is entertaining and scary as hell, and the middle section, the section on craft is honest, practical and hard-nosed as hell. And also entertaining. I like everything he said about craft because I agree with all of it. “The best form of dialogue attribution is said.” “You should avoid the passive tense.” “I believe the road to hell is paved with adverbs.” Simple, direct, absolute, I’d go farther than King and say that these are rules that should be tattooed backwards on the foreheads of all beginning authors so they see them every time they look in the mirror. What he said. Thanks, Kerri. My daughter-in-law, who was an editor at the time, pointed out to me that J,K. Rawling’s greatest flaw in her early books was an overuse of adverbs. Can’t remember which one it is but either the third or the 4th is the worst. After that, someone must have told her the same thing, because she stopped using them so promiscuously. I’d never noticed (which is one of the many reasons why I’m neither a writer nor an editor) because the story just carried me along but once she mentioned it–there it was. Since then, I’ve become a lot more sensitive to the issue. You won’t be sorry, Elizabeth. And Joyce, there are exceptions to every rule. Georgette Heyer is one of the exceptions to the adverb rule. Okay, you made me smile. 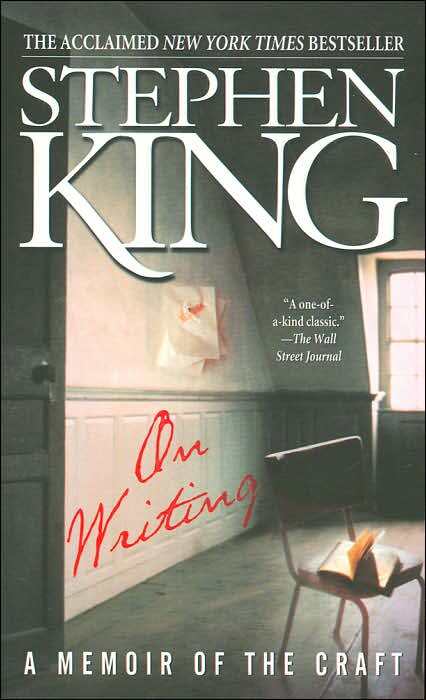 King’s “On Writing” happens to be my go-to favorite book for writing advice. I don’t read him much because horror freaks me out and I can’t sleep afterward; his storytelling is flawless, though, and his advice is pure gold. He’s a realist, but he does not discourage. I appreciate that. Especially after my submission got accepted for the first time last week; just a short story. After I signed my life away, I was promised $45. I AM RICH!!! Mwhahahaha! Congratulations, Kate! Rich indeed–I expect that you are making the awesome wage of about 5 cents a day, right? 🙂 But wonderful news, getting published. Dana, I bought today the updated, digital version of Elements of Style. Seems like I have been hearing about that most of my (long) life and could be it’s about time to read it–well, some time this year, anyway. Why do I want a copy of “Restless in the Grave”? Why wouldn’t I? I’ve already listened to it & absolutely loved it!! How could you not just love seeing Kate & Liam working together? I loved learning about what happened with Liam & Wy! As you can tell, I just “loved” almost everything about this book. I say “almost “only be cause you did leave some things open-ended (hopefully to be settled in the next book). Hopefully, this gets to you on-time. I’ve read On Writing twice. Perhaps the most encouraging book about writing I’ve seen. Time to read it again, I think. Adverbs: I think there is room for them–occasionally–in an exceptional story. I’ve read the Harry Potter series several times. Somewhere in the middle of that I read On Writing, and even though I see King’s point, the stories still carry me through–I rarely notice the adverbs. I also thought this book was good. You and I met once at a signing in Colorado and I told you I’d learned two things from you as a writer: how to use the land as a character and how humor can spring up in life-and-death moments. (Jim Butcher is good at that, too.) I hope some day we’ll see YOUR book on writing and life. I don’t know, Matt. I’m no Stephen King. You are Dana Stabenow creator of a whole world. I love the your descriptive writing. When Kate talks about looking out her new windows at the Quilaks, I am closing my eyes and being right there with her. I would really, really love to read your autobiography. One of the things I like about your dialogue is that it is real. Kate has real reactions to what people say to her and how she is treated. And just like everyone else I totally love how you have brought Mutt to life. I love how you use Alaska as a character and just change the geography to suit your needs as a writer to keep Kate’s world real for us.. I could go on, but you get my drift. There is a reason there are over a thousand Danamaniacs. Stephen King’s book is a good teacher. I love his style.